Great post, Staci. I agree with you. 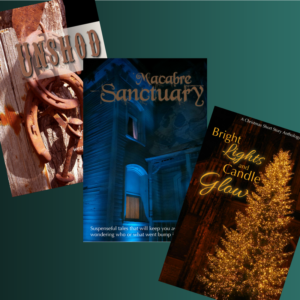 I have done a few anthologies, and wrote out of my comfort zone. It does give you a new perspective and appreciation for all writing genres. I would love to use portions (if not all) of this article in a literary mixer presentation I have been invited to speak at next week. Topic: The art of the short story. Great list, Staci! I’ve enjoyed participating in anthologies and the relationships formed with other writers has been great. I do like the idea of experimenting with other genres, although no matter what I do a bit of mystery/suspense/romance seems to come through. These are excellent reasons to participate in an anthology. What a great, insightful read! I think for me personally, I enjoy anthologies because they’re like “writing sebatacles”. Participating in an anthology helps me to take a break from my longer works and helps to combat writer’s block by exploring the other ideas that pop up when I’m trying to focus. Giving these ideas life as short stories helps me to refocus on my main projects without starting a new long-term project. Looks like you and Mae both resonate with no. 5 above. I like that benefit, too. Writing short stories lets me vacation in another world for a while. When I come back to my novel, it’s like climbing in my own bed after a week in a hotel. So comfortable, and I appreciate it more than I did before. These are all great reasons for contributing to an anthology. What I’ve found the most beneficial is “meeting” authors I might not have encountered otherwise, and getting to know them on social media. It’s great to connect and support each other. I also like the idea of stepping back from a major novel commitment for a brief time to dabble in short fiction. It’s almost like a vacation that usually generates a new creative spark, which in turn carries over into my WIP. I really like the connections and relationships anthologies afford. It’s one of my favorite benefits. Thanks for stopping by, Mae, and for sharing your thoughts.